A finished print is something to celebrate. Now, you can do it with a victory song. During our first hackathon, Formlabs engineers developed a pocket-sized Form 2 that communicates printer status with LEDs, and plays a celebratory song once a print finishes. Mini Form 2s light up in different colors according to your Form 2 printer's status. Using Particle’s Photon board, the mini printer connects with the Form 2 Dashboard API to get the current status of the 3D printer. 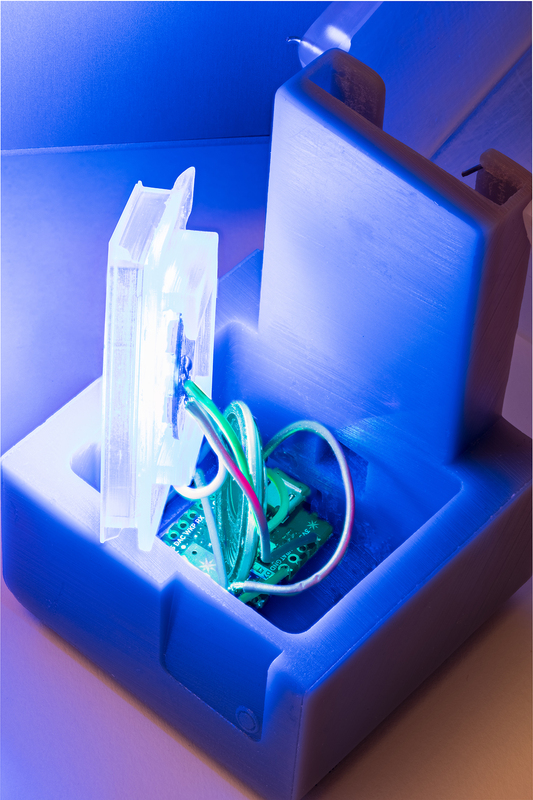 Connected LEDs flash different colors that correspond with whether a printer is idle, currently printing, or offline. Want to try it out for yourself? Follow along with this tutorial to build a dashboard-powered, mini Form 2. 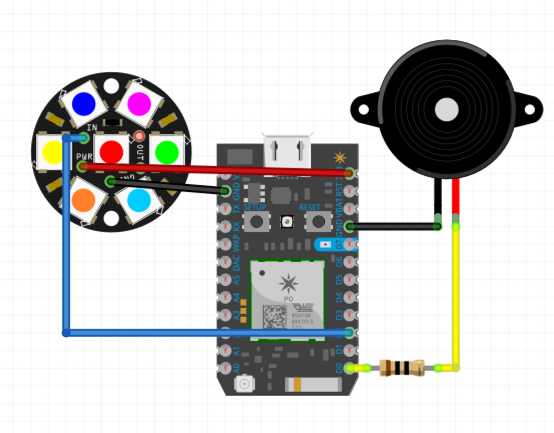 Solder wires to connect the NeoPixel and speaker to the Photon board using the schematics below. Make sure the Photon is not plugged into power while wiring or soldering. Powering Photon via micro-USB is the simplest method for this tutorial. Alternatively, use a 3.7V LiPo battery as a power source. The mini Form 2 body was designed for the battery pack to fit where the Form 2 resin cartridge slot is. Wiring diagram for the mini Form 2. Wires should come out of the top of the Photon board and be soldered beneath the NeoPixel board. Follow the Particle’s Photon Getting Started guide to get your Photon connected to the internet. First, log in to the Particle Console. You should see your Photon in the list of devices. Next, go the Integrations tab and create a new webhook. Then, choose “Custom JSON” and paste in the text from the API OAuth Particle Webhook file. Paste the text from the API OAuth Particle Webhook file into the custom JSON webhook. Repeat the same process for the API Status Particle Webhook. You should then see both webhooks in Integrations. Both webhooks will appear in Integrations. Use the Particle Build web program to upload the Dashboard printer code to the Photon. Include the NeoPixel library. To do this, you first create a new Particle App. Give the app a name, then paste in the text from Dashboard Printer Code - NeoPixel Lights and Speaker. Click the folder icon in the left sidebar to save the app. 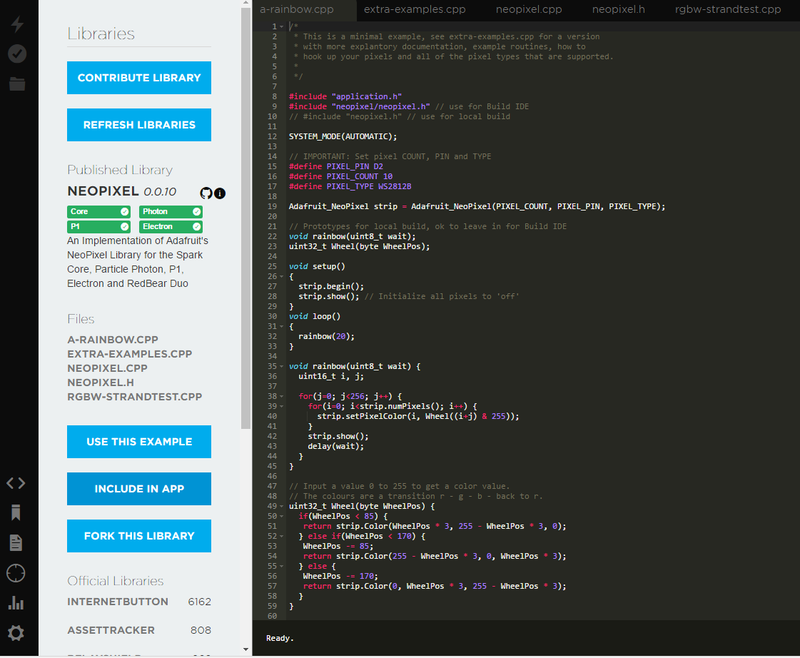 Use the Particle Build web program to upload the Dashboard printer code to the Photon. Next, include the NeoPixel library. Select the bookmark icon from the sidebar to view available libraries and choose “NeoPixel.&ldquo; Press the “Include in app” button and then click the lightning bolt in the top left to upload your code to the Photon. Include the NeoPixel library in the app. Initially, the NeoPixel lights will be white while it connects to the Dashboard API. Once connected, the color should change depending on your Form 2’s status: orange when idle, blue (with a purple flash for each layer completed) when currently printing, or red when offline. When your Form 2 is printing, the mini Form 2 will flash a purple light for each layer completed. Download the mini Form 2 .STL files from Pinshape. 3D print the base in Grey Resin, the cover and tank in Clear Resin and, optionally, the Build Platform in Black Resin. Attach the cover to the printer base using a paperclip as a hinge. Place the electronics inside; the ring of lights should slide into the printer tank piece and the Photon should fit nicely into the notches on the inside wall of the base. The electronics should fit snugly inside the mini Form 2, with an opening in the back for the micro-USB to plug into the Photon. 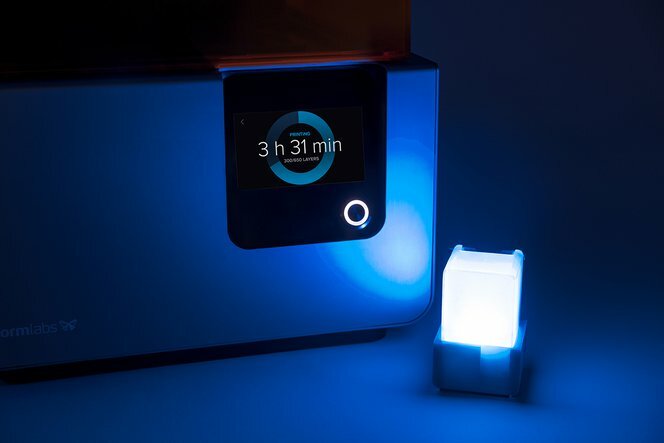 Start printing and watch the mini Form 2 flash its status lights. Once your print is complete, enjoy the sweet sounds of victory.